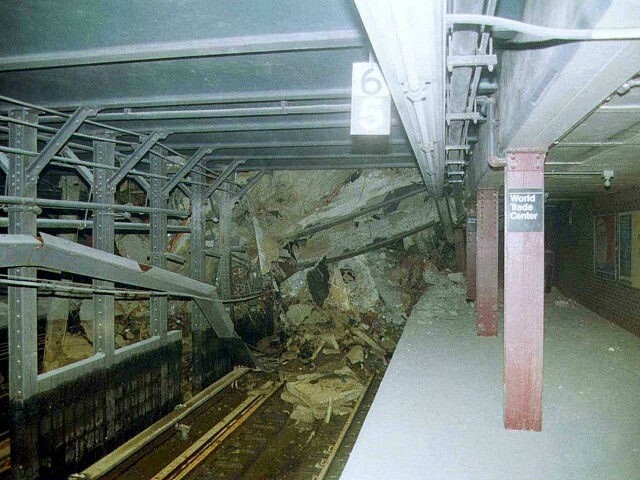 The New York City subway station destroyed by terrorists who attacked the World Trade Center on September 11, 2001, re-opened on Saturday for the first time in 17 years. Metropolitan Transportation Authority officials unveiled the renovated Cortlandt Street station, which ran underneath the World Trade Center, and named the re-opened stop on the No. 1 line “WTC Cortlandt” to commemorate the site where thousands lost their lives on September 11, 2001. It took years for the station to re-open because the Port Authority decided to keep the station closed while reconstructing the area around the World Trade Center complex, the New York Post reported. The renovated station cost $181.8 million and features a mosaic on the station’s walls displaying the text from the 1776 Declaration of Independence and the 1948 U.N. Universal Declaration of Human Rights. Construction workers had to completely renovate the ceiling after pieces from the World Trade Center came crashing down, and they had to rebuild 1,200 feet of track on both sides of the station.